GMA Network will air the Pacquaio vs Vargas title fight on November 6, 2016 (PHT) at 10AM. The Mexican/American WBO World champion faces the former 8 division world champion Manny Pacquiao of the Philippines to defend his title for the 2nd time. The much taller and younger Jessie Vargas is coming off an impressive TKO win in his first title defense against Sadam Ali last March of 2016 while Pacquiao who announced his retirement 7 months ago is coming back to prove that there is something left in him. Pacquiao vs Vargas will be telecast late on GMA 7 for free and will also to air live blow-by- blow on DZBB 594, FM station Barangay LS and all RGMA stations nationwide at 9AM. 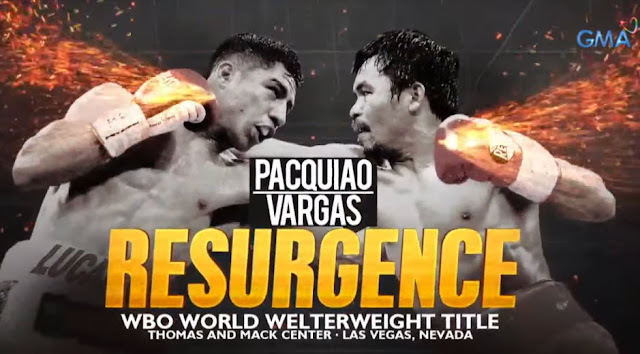 The undercard of Pacquiao vs Vargas also includes the Filipino "Flash" Donaire defending his title against the hungrier Jessie Magdaleno of USA.